The Recipe from the site epicurious. 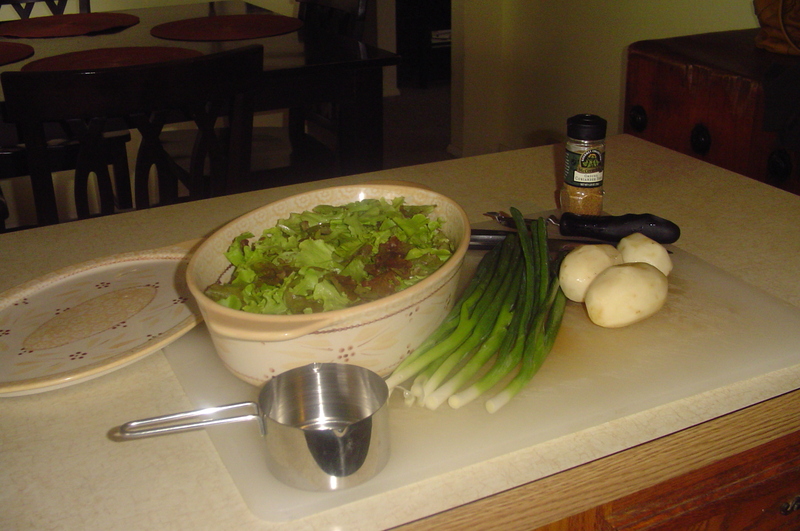 1 c scallions (or onions) , 1 clove garlic, minced, 3 tbsp butter,3/4 tsp coriander, 3/4 tsp salt ( I did not use this much because of the stock) , 1/4 tsp pepper, 3/4 diced potatoes ( I doubled this), 8 c chopped lettuce, & 3 c water( I used stock). Cook onion & garlic in 2 tbsp butter over low heat. 3-5 min. Add coriander, S & P, cook 1 min. 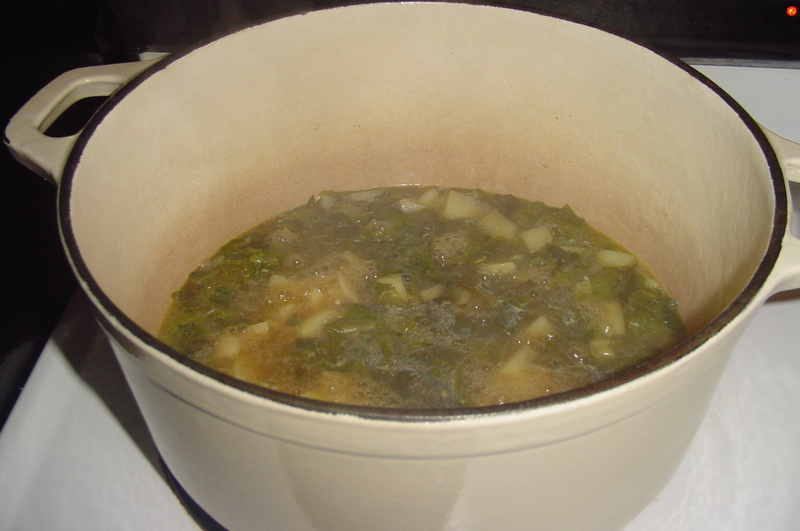 Add potatoes, lettuce, water or stock, bring to a boil. Reduce ,cover & simmer until the potato is tender. 10 min. Puree soup in batches in blender. ( careful when blending hot liquids. Add small amounts at a time.) Transfer to a saucepan. Add remaining butter. Enjoy! This entry was posted in Dinner, Lunch on September 17, 2011 by andrewsbeth. Hi! Good to see you and GP this morning. The soup is so interesting. 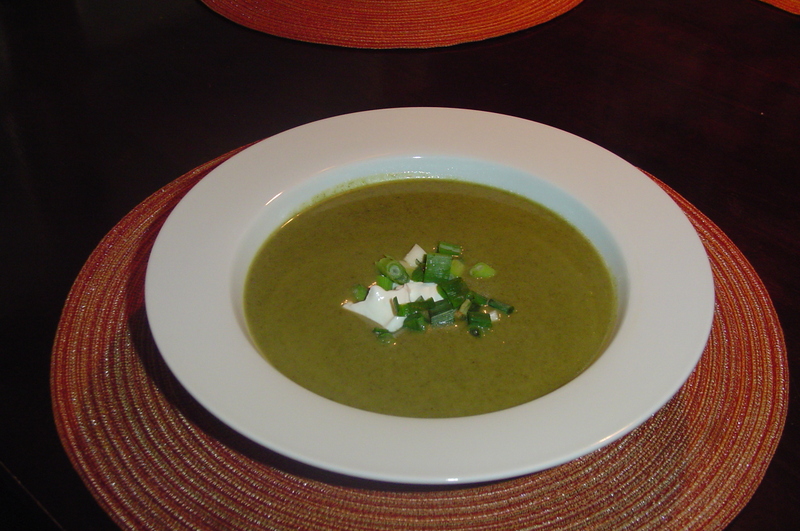 I’ve never known anyone to make lettuce soup, but I may have to give it a try this fall. If it’s a hit, I can see myself using up lettuce this way quite often. And I heartily agree with the substitution of chicken stock for water. I’m sure that improved it immensely. You know Tom, I had never heard of this soup either till GP. I was surprised about the taste. I can see why you blend it in all the recipes I looked at, because wilted lettuce not so good to eat. Really, I say give it a go! I am so happy that GP went to the market again this morning! I wasn’t ready until 10:15 today- I got to see Richard Pryor play the ukelele in a band! Soup sounds weird but looks great. It must be just more delicate than endive or escarole, right? We didn’t go till 10:30. We saw the band too. GP loved the music and the dancer! He couldn’t get over that she just kept going, but never smiled. Yea, that dancer was interesting wasn’t she? I loved the side kick I’m gonna get that fly out there somewhere move every now and then….very different but fun.